1824 National Gallery in London founded. The English poet Lord Byron dies in Greece. 1824 Goya obtains leave to take the cure in France,and leaves in June. After a stay of two months in Paris he settles in Bordeaux with Leocadia. 1825 Paints miniatures on ivory and works on lithographs of bullfighting scenes. He becomes critically ill.
1825 Manufacture of the sulfur match. 1826 The last death sentence for heresy is carried out in Spain. The French physicist Niepce produces the first heliograph, a direct precursor of photography. 1826 Journey to Madrid to obtain a royal pension; receives permission to return to France. Portraits of friends. 1827 Summer: last journey to Madrid. The Milkmaid of Bordeaux. Nuremberg. Thought to be of noble birth, he becomes an international celebrity. 1828 Goya's grandson Mariano arrives in Bordeaux. Goya dies on April 16. At the age of 77 Goya decided to leave his home. The reason was the political situation in Spain under the despotic rule of Ferdinand VII. 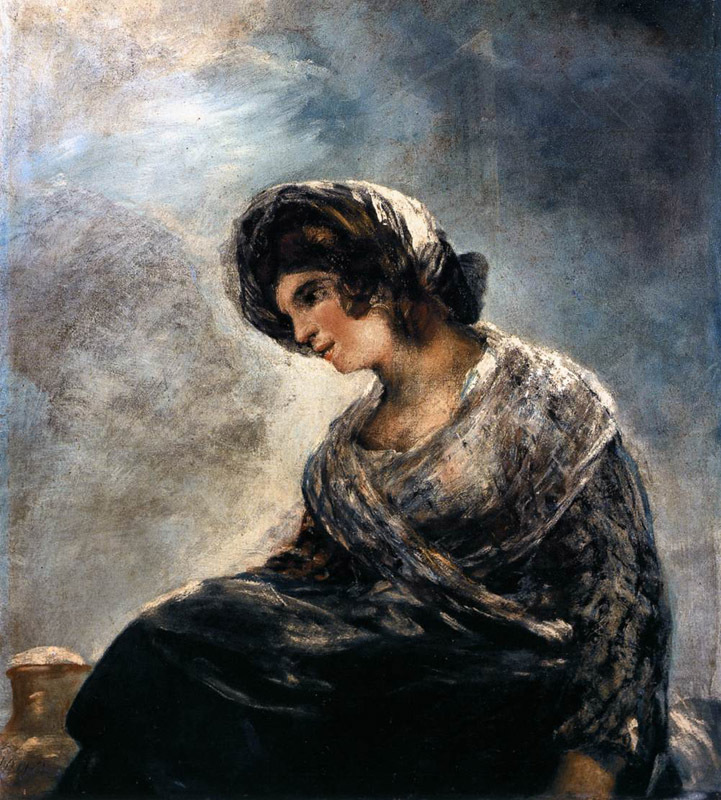 Although Goya was still the official First Court Painter, his position was compromised. His prints alone, which he stored in his house, would have been incriminating, since even the possession of documents or caricatures that were deemed heretical or critical of the government was a punishable offense. His companion Leocadia was even more seriously threatened because of her known liberal views. They agreed to go into exile in France. 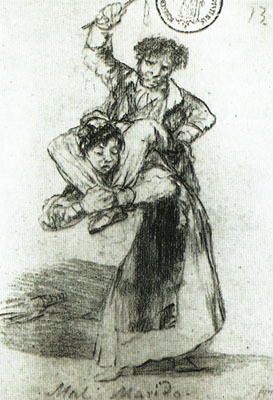 Thus Bordeaux became the final stage in Goya's life. The grizzled, stone-deaf painter maintained an astonishing degree of activity till the end. Driven by simple curiosity, he traveled alone to Paris. He experimented with new artistic techniques and created images that were far in advance of the art of his times. His creative powers were undiminished right up to his death. Lopez was a sought-after court painter under Ferdinand VII. 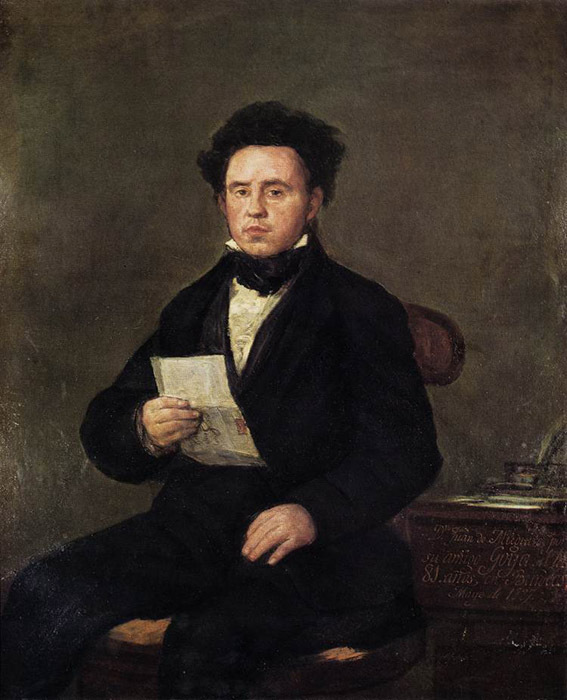 He executed this imposing portrait of Goya while the latter was in Madrid. in such a proud pose, is the successful artist. 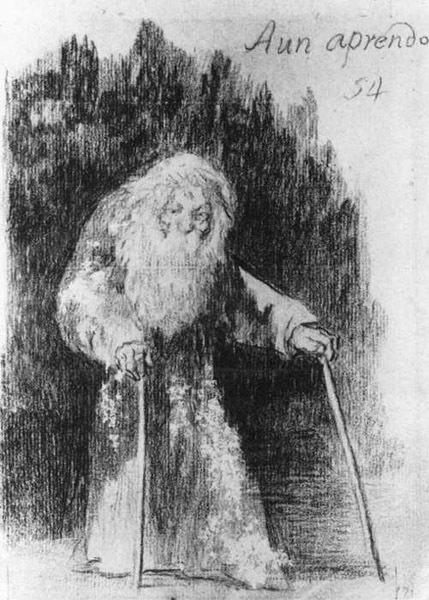 This drawing of a fragile old man seems to be a symbol of Goya's own attitude in old age. In spite of his infirmity, he never lost his curiosity about life. Sitting on his wife's shoulders and using a whip, a man beats her as he would a beast of burden. Goya often dealt with relationships between the sexes in his satirical drawings. As with other themes, he adopted a highly critical viewpoint. In the last years of his life, he often used black chalk for his drawings and frequently added a few words of commentary. Goya made preparations for his exile. His house, the House of the Deaf Man, was transferred to his 17-year-old grandson Mariano so that it could not be confiscated. Then he hid himself for three months with a friendly priest and waited for a favorable moment to submit to the king a petition to leave the country; his pretext was that he wanted to take the cure for his poor health at the spa in Plombicres in France. Permission was granted. He had to use this ruse in order to secure not only a leave of absence, but also his annual salary of 50,000 reales. He left immediately and, after an arduous journey of 900 kilometers (560 miles), he arrived at the home in Bordeaux of his old friend Leandro Fernandez Moratin, who had already been living in exile for some time. The latter reported in a letter that "Goya has actually arrived, deaf, old, clumsy and weak, and without speaking a word of French. He has come with no servants ... but is so eager to get to know everyone." Hardly had Goya recovered from the exhausting trip when he went on to Paris. He stayed there for two months and lived with relatives in a smart, lively quarter of the city. From police reports - all Spanish emigrants were watched by undercover agents - we know that he mainly spent his time on tourist visits and going for walks. Anything that particularly interested him, he sketched in his sketchbook, adding the words "I saw this myself." It is possible that he also visited the current special exhibition at the Louvre, which included works by his younger contemporaries Jean-August-Dominique Ingres (1780-1867) and Eugene Delacroix (1798-1863). Back in Bordeaux, Goya met his companion Leocadia and her little daughter Rosario. Together, they moved into a furnished flat in the Allee de Tourny. But soon he was drawn back to Spain. Moratin was surprised at his friend's energy. "If you permitted it, he would travel back on a stubborn mule with his beret, his coat, his stirrups, his bottle of wine and his rucksack." 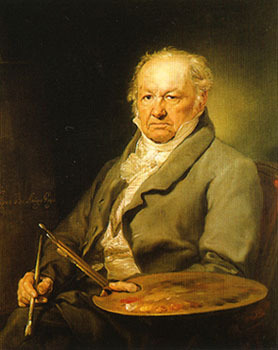 In fact, Goya traveled twice more to Madrid in the following year, not least to make sure that his pension would be paid to him. This painting is one of the last portraits by Goya and shows a distant relative he had met in Bordeaux. 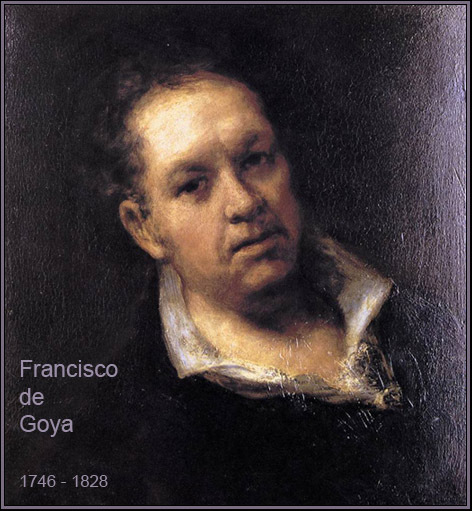 A fairly lengthy inscription indicates that Goya painted this portrait at the age of 81. Like many of his contemporary fellow-Spaniards, Goya was, throughout his life, an aficionado, a keen follower of bullfighting. According to his own testimony, he was even daring enough in his youth to try his skill and courage against a young bull. 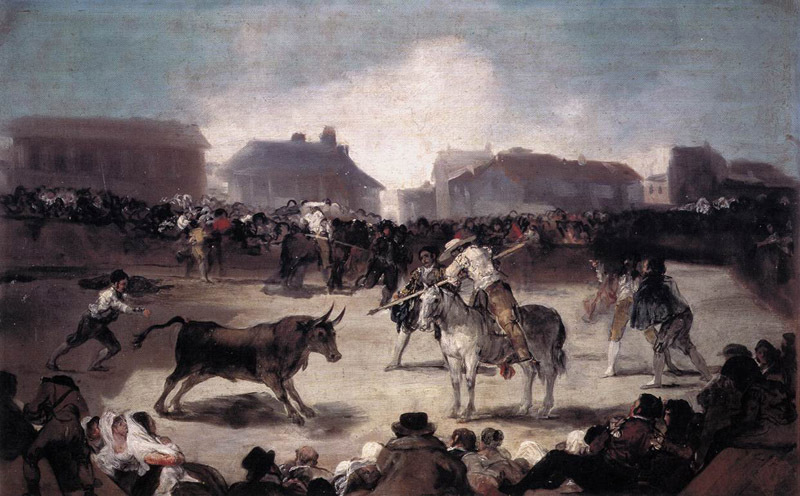 During the second half of the 18th century bullfighting was more popular than ever, before it was prohibited in 1805.In Saragossa, and later even in the Madrid ring and in Seville in Andalusia, Goya attended some of the most famous bullfights of his day. As a motif in his art, bullfighting occurs throughout his work, beginning with his tapestry designs and continuing right up to his last paintings, executed in exile in France. 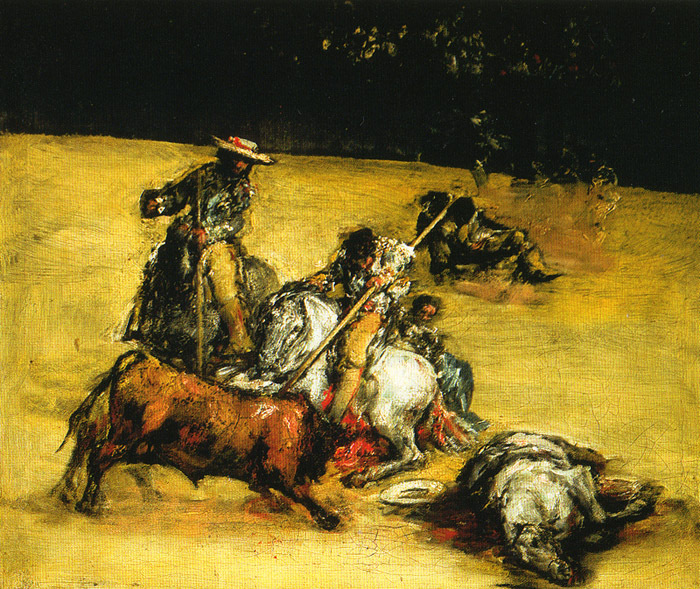 He often selected scenes from bullfights as a motif when he painted pictures without a commission. 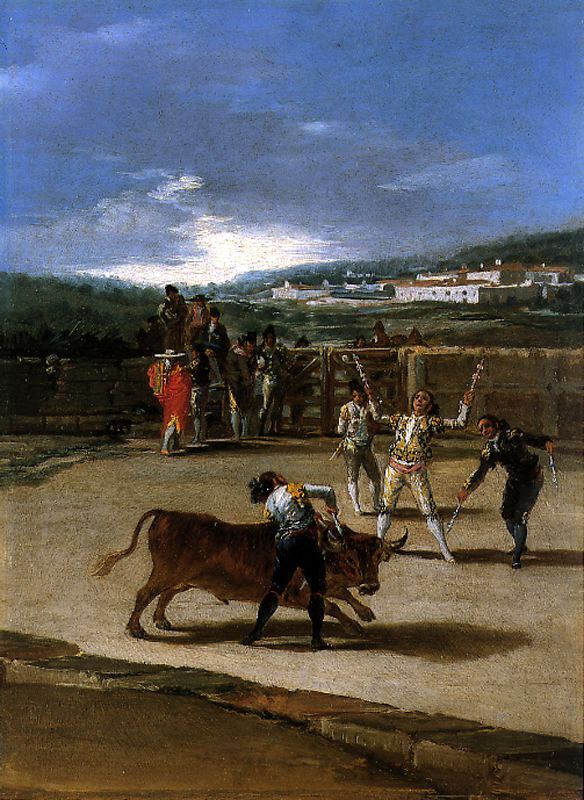 The small painting Village Bullfight, for example, shows an improvised corrida, as in the Spanish countryside. The spectators have gathered in a broad circle in the village square and are watching as the mounted torero and the bull face each other. 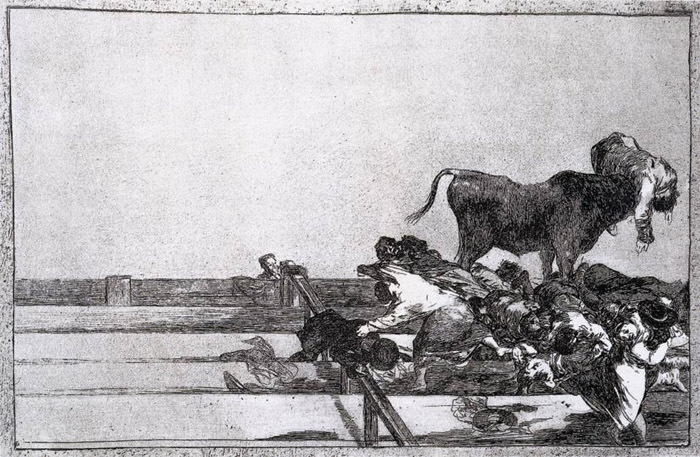 Immediately after the war of liberation against the French, Goya worked intensively on the subject of bullfighting and created a series of 33 etchings under the title La Tauromaquia (The Art of Bullfighting). At that time in Spain, the motif of the bullfight had become a symbol of the struggle against the Napoleonic troops; in popular prints the bull stood for the French, while the courageous torero represented the people of Spain. 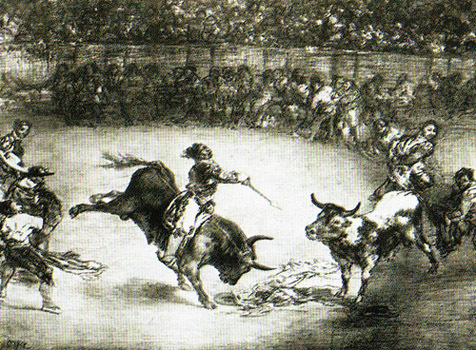 Initially, Goya's graphics were based on a history of Spanish bullfighting written by the father of his friend Moratin. During the work, however, he left the historic framework behind and selected the subjects arbitrarily. He remembered the legendary bullfights of his youth and depicted the most dramatic moments of the corrida. In these prints Goya demonstrated an extensive knowledge of the sport. He manipulates his etching tools with the same precision and skill as the picadors and toreadors use in wielding their lances and swords. Light and shade are distributed in a masterly fashion, and print after print reveals new compositions full of tension. Goya boldly juxtaposes full and empty spaces, as for example in the print An unfortunate occurrence among the spectators at the Madrid Ring. 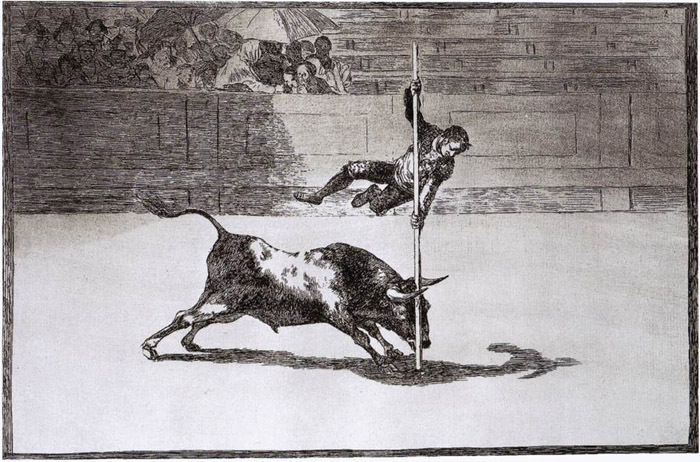 In exile, almost 80 years of age, Goya returned once more in 1825 to this old passion, and exploited the newly invented technique of lithography for a small series entitled The Bulls of Bordeaux. In prints such as The Famous American Mariano Ceballos, he mainly reproduced the atmosphere in the bullfighting arena, the spellbound fascination of the spectators, the air tense with excitement. As though drawn by magic, the spectators press through the barriers and move closer and closer to the blood-soaked spectacle. 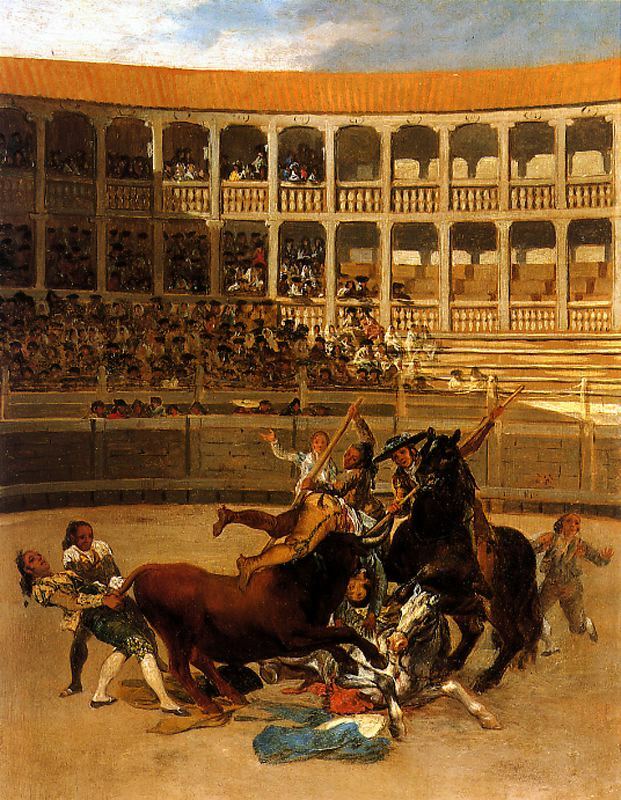 At about the same time, Goya painted a few small pictures on bullfighting themes. The drama of the event was expressed in these with impasto color and a complete lack of detail. The churned-up colors, the shimmering reflections of light, the mobile shadows -everything contributes to the impression of dynamic movement.